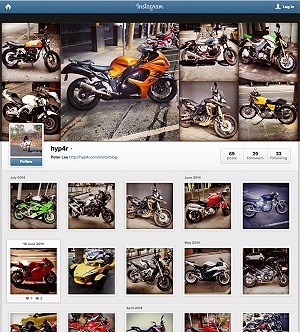 Suzuki Hayabusa GSX1300R news and reviews with everything else you need. Follow the links below! Welcome to the Suzuki Inazuma 250 review. The Inzuma otherwise known a ‘Lighting’ is the latest entry into the 250cc commuter and learner motorcycle class. In pictures the Inazuma 250 looks good. It has Suzuki B-King styling clues in the front light surround, tank and front fenders along with the tail light design. In real life it doesn’t quite match up as the chrome muffler heat shroud was a real visual distraction and seemingly at odds with the rest of the bike. The engine looks too small, so the proportions while large enough overall looks just OK rather than standing out. 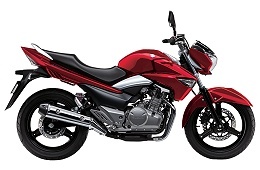 In terms of engine specifications the Inazuma is class average for a non-sports motorcycle. EFI with SOHC which indicates it made for reliability and low maintenance. The long stroke engine usually means it won’t need as many revs to get going… Power should be OK and likewise performance. It should be a good basis for any future performance enhancements! The Inazuma’s build quality looked good, same as any other in the entry level class – just remember its not up to the GSX-R standards. What I found interesting was that the instrument cluster includes a gear indicator! I presume the cluster is used on other ‘sportier’ Suzuki motorcycles. The biggest problem with the Inazuma is its 2013 pricing. At just around $5900 AUD on the road it is too expensive especially when compared to the Honda CBR250R. It might have a chance under the $4000 on road pricing though because there’s nothing else convincing out there at the moment. In the end and unfortunately I am unlikely to ever ride the Inazuma since few of my friends would ever consider this style in a 250cc – only the traditional naked like the CB400 figures in most of our thinking. Quite an interesting view but one that probably reflects the market in this country hence the demise of the B-King. It may prove popular in the commercial market though. Peter's MotorBLOG - It's not Just about power. Thanks for dropping by! Feel free to subscribe to the RSS feed. Copyright © 1999 Peter Lee except for content, written or images otherwise from press material or other referenced sources where available.